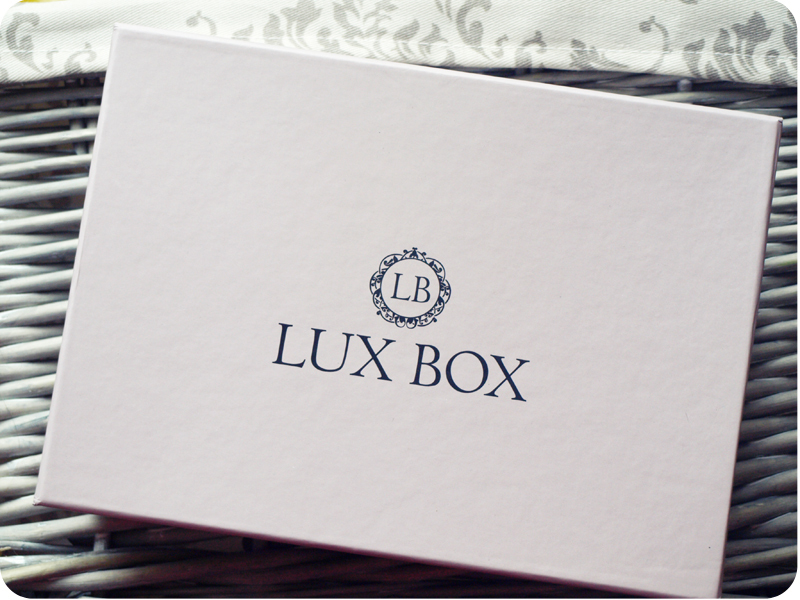 The August Lux Box* was very late due to some problems etc, but it finally arrived at my doorstep in September. I received it about two weeks ago, but didn't have time to review it earlier. The box included one full size product and 4 samples. I got 2 face creams, face oil, face mask and a hair pomade. I will list the products in order from the one I liked the most to the one I didn't like. "This moisturizing mask covers your skin with a generous boost of hydration! Immerse me acts like a balm for parched and dry complexion as it gets absorbed in a blink of an eye and makes sure your skins longing hydration will never turn tail. Its nourishing essences shoo away the dryness and replenish moisture into the deeper layers of your skin. So, why not make it an everyday affair? For dry to very dehydrated skin (all ages)." Use Discount code 3STAR30 for 30% off "Shrink & tighten", "Off with those heads" and "Spots got shots"
I am a big fan of face masks of any kind and always on a lookout for a new one. I really enjoyed using this mask. I love cloth face masks- they are very convenient and easy to use. This one is very hydrating and left my skin feeling soft and looking fresh and radiant. "Prevents signs of premature ageing caused by environmental exposure by delivering high SPF protection while providing intense hydration with an oil-free matte finish. Featherweight, easily absorbed formula protects and restores the appearance of healthy skin. 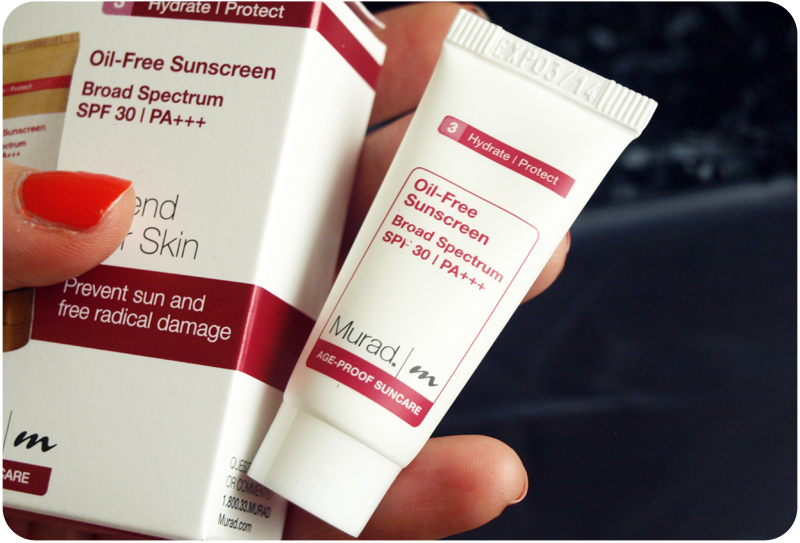 MuraSolTM provides free radical protection whilst supporting skins natural defence system. Pomegranate extract and vitamin E deliver essential antioxidants and moisture to keep skin soft and supple. Micro minerals provide an oil-free matte finish." The Secret’ has been talked about a lot in the press recently and here it is for you to buy! Celebrate your natural beauty with this handcrafted Betty Hula Anti-Ageing Oil. With a special blend of ingredients working in harmony with your skin, to help repair damaged and tired cells, combat dryness and reduce wrinkles to reveal your most radiant, youthful self. We would love to tell you a bit more, but that’s the trouble with Secrets, just enjoy the results." I love face oils, but I have about 5 different ones at the moment, so I used this one for my elbows and it really helped to soften the skin :) I am definitely using the discount code for Betty Hula- 60% off is mindblowing! I will stock up on body butters for winter. "This beautifully uncomplicated light fragranced moisturiser is so soft on your skin that youll feel and see the difference from the moment you gently smooth it on. It can be used on all skin types and is also ideal for very dry or mature skin. So versatile that you can use it as a day or night cream - it perfectly compliments any makeup and is designed to leave your skin feeling soft, fresh, comforted and nourished. Receive 20% off orders over £20 at www.skinkindcosmetics.com with discount code CAT29TGY"
Another face cream. I noticed that most beauty boxes include 2 or more face creams in each box and people always complain about that. 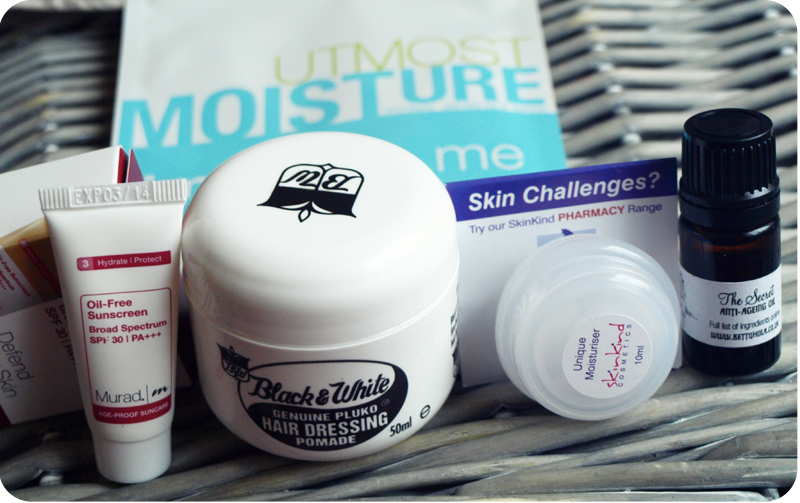 I always give the samples to my husband :) He has really dry skin and can't live without moisturisers. This cream smells really nice and it is very light weight. I tried it and I quite like it. It absorbs fast and moisturises really well. 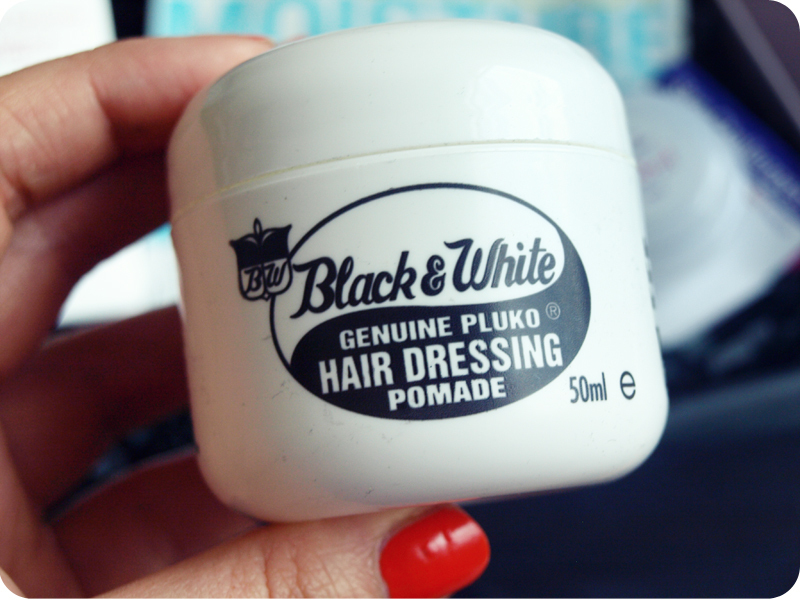 "Black & White Genuine Pluko is a versatile Hair Dressing that allows you to mould, sculpt and create texture. It is firm but pliable giving long hold control that lasts all day. Simply work a small amount of the Genuine Pluko into your hair from the roots, through the mid-lengths and to the ends with your fingertips and style to achieve desired effect." Overall, I am not very impressed with this months box. Previous ones were much better, with a great product variety. I am looking forward to the October Box though and I hope it is an amazing one!